All transportation by 4x4 overland cars with a window seat guaranteed. Notes: This tour can be conducted at any time of the year. Please contact office for best prices. Other tailored made Africa packages are available in our website or contact office for package guidance. Please note bookings can only be confirmed 1 month prior to travel date to ensure availability on lodges. You meet our tour rep at Heathrow Airport and board onto your flight to Tanzania - Arusha. Depending on your arrival at Kilimanjaro International Airport, you will be assisted through the immigration and customs formalities. You are transferred by our car to your hotel in Arusha. This afternoon if time permits, you can have an optional excursion to nearby Arusha National Park exploring Montane forest in search for black and white Columbus monkeys, or relax at the hotel after your long flight. Today you head towards the spectacular Lake Manyara National Reserve in the Great Rift Valley. Lake Manyara is a birdwatcher's paradise. Marvel at the variety of species: spoonbill, teal, pelican, kingfisher, hornbill and cormorant. In the tall trees, forest monkeys leap from branch to branch on the slope of the Great Rift escarpment, elephants stand in the shade of the baobab; and in the acacia woodland, and lions lie draped along the branches of the umbrella trees. Overnight in Lake Manyara Lodge or similar category lodge. Early in the morning, you head towards the Serengeti National Park. You drive through Olduvai Gorge: a gorge that become famous since 1959 when Dr Leakey discovered a human skull dating back to 1.75 million years. This afternoon you have a game drive through the Serengeti National Park as you head towards our lodge. Dinner and overnight at the Serengeti Serena Lodge/Sopa Lodge or similar category lodge. Morning games drive after breakfast. Enjoy the endless plains of Serengeti with game viewing, a magnificent experience awaits as you travel to the most famous wildlife park in Africa the legendary Serengeti. Here you might have the chance to see the migration, where thousands of zebra and wildebeest make trip from the Masai Mara every year. Packed lunch is served and proceeds for an afternoon game drive. 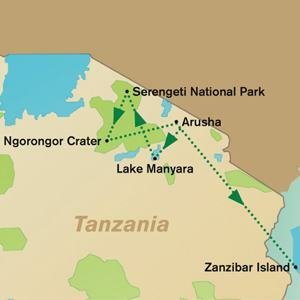 This morning you head for the Ngorongoro Crater. This afternoon you descend the 2200 feet into the world's second largest crater by 4-wheel drive vehicles for a safari. Over 30000 animals live within the crater, including wildebeests, elephant, lion, dik-dik, and wart hog, whilst on the lakeside there are pelicans, ibis and flamingos. Overnight, overlooking the rim of the crater in Ngorongoro Wildlife Lodge or Sopa Lodge. After breakfast, drive back to Arusha for lunch. After lunch transfer to airport for an overnight flight return to UK or extend your trip to Zanzibar. After lunch at Arusha, fly out to Zanzibar - Lying just off the coast in the Indian Ocean, the island of Zanzibar beckons with its beautiful white sand beaches and heady atmosphere of spice-laden bazaars in stone town. You get transferred from the airport to the beach hotel for the next 3 nights in 5 star Bluebay Beach/Breezes Beach Resort or similar category hotel. You checkout of your hotel and head towards Zanzibar for your guided tour of the stone town. Overnight in stone town, Zanzibar Serena or similar category hotel. Early in the morning, you catch a flight from Zanzibar to Dar es-salaam airport for our return flight to UK. Arrive Heathrow London late evening or next day morning depending on your flight timings. This tour can be conducted at any time of the year. Please contact office for best prices. Other tailored made Africa packages are available in our website or contact office for package guidance. Please note bookings can only be confirmed 1 month prior to travel date to ensure availability on lodges.